Experience two of Victoria’s must-see attractions in one very special day. Fly from our Melbourne heliport to the 12 Apostles, where you’ll see the spectacular sights of the Shipwreck Coast from the air, then on a guided ground tour. 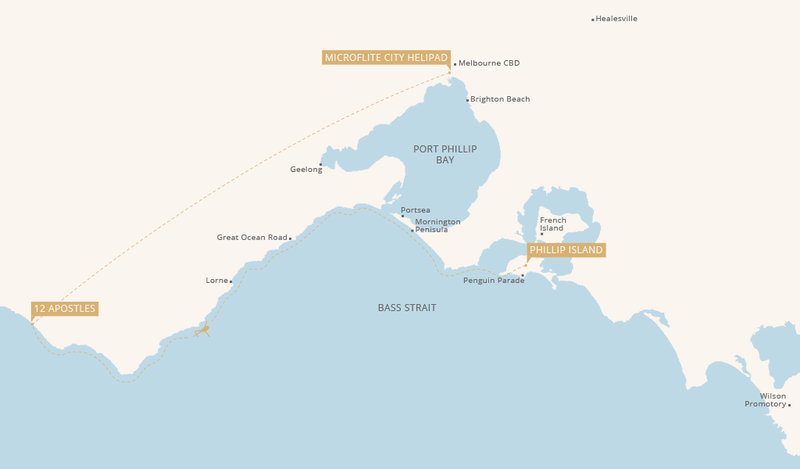 The helicopter will then follow the Great Ocean Road as it winds through picturesque tourist towns. You’ll be met by a chauffeur on arrival at Phillip Island Airport for dinner at one of the region’s best restaurants and a ranger guided tour of the iconic Penguin Parade. Following the tour, you’ll be driven back to our heliport or your accommodation.